Brunswick Corp. today announced it has ended the sale process for its Sea Ray business, including the Meridian brand. Brunswick said it will retain and revitalize Sea Ray and leverage its premium brand to capitalize on growth opportunities in its sport boat and cruiser product categories. Brunswick also announced it will discontinue Sea Ray sport yacht and yacht models, resulting in the wind down of yacht production in the third quarter of 2018. "Over the last several months, we have engaged in a thorough sale process for the Sea Ray business, which we believed would generate the highest value for our shareholders," Brunswick Chairman and Chief Executive Officer Mark Schwabero explained. "Although there was interest in the business, the offers we received did not reflect an appropriate value for this premium brand, and did not meet our expectations." Schwabero said the lower value was largely due to the persistently weak financial performance of the yacht product category, which complicated and obscured the value of the remainder of Sea Ray. "As the sale process neared conclusion, we started to evaluate other strategic options beyond our original plan to sell the Sea Ray business in its entirety," Schwabero continued. "Based on that re-assessment, we have concluded that our best opportunity to maximize value is to retain the Sea Ray brand and refocus the business on the sport boat and cruiser product portfolio." As part of the transformation of Sea Ray, Brunswick will discontinue sport yacht and yacht models and begin an orderly wind down of yacht production. "These combined actions will create a revitalized Sea Ray that will benefit from continuing synergy with our broader marine portfolio --and with targeted ongoing investment - we believe will offer increasingly attractive profitability and cash flow returns. We believe that this is the best solution to generate value for our dealers and shareholders now and in the future," Schwabero said. “It is great to see, that through the sale process, Brunswick recognized the importance of one of the most esteemed brands in our industry. It truly stands alone in its history and in its success over the many years since Connie Ray launched the brand in 1959," said MarineMax Chariman and CEO William H. McGill, Jr. "It remains the most searched for brand on-line, holds the top market share in most categories and sizes, has among the best distribution in the industry and is an aspirational purchase by boating enthusiasts." MarineMax is the largest retailer of Sea Ray boats, historically representing over 50 percent of Sea Ray's world-wide sales. "We are disappointed by the decision to discontinue sport yachts and yachts, but we are excited for the future of Sea Ray and the focus on sport boats and sport cruisers," McGill, Jr. added. 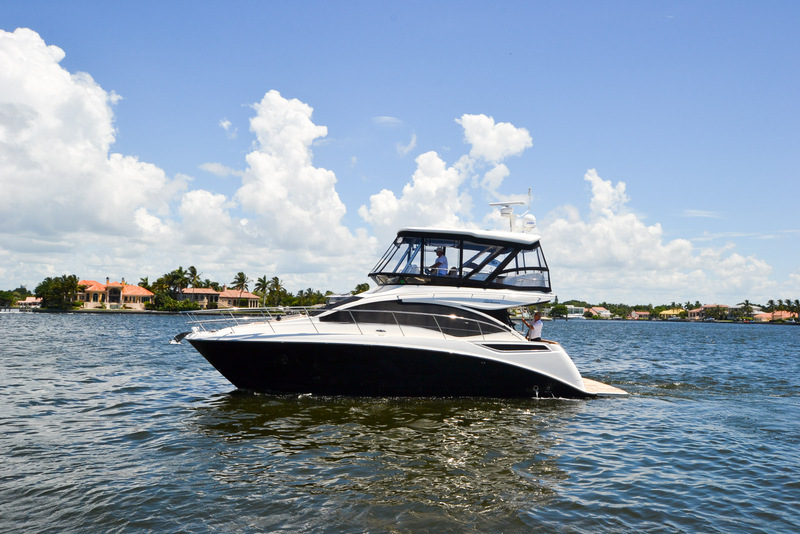 Sea Ray remains one of the most aspirational and premium recreational boat brands, and the company's sport boats and cruisers set an industry standard, said David Foulkes, president - Marine Consumer Solutions. "We will focus our resources on advancing our position in these segments, with an emphasis on the growing and evolving 24- to 40-foot categories," Foulkes said. "Moving forward, Sea Ray will continue to offer new products, features and services that leverage our technology and innovation initiatives aimed at enhancing the quality of the consumer boating experience." "Brunswick will maintain the capability to provide outstanding service and support to our dealers and installed base of all Sea Ray customers, consistent with the Sea Ray brand promise and history," Schwabero said. "We appreciate the dedication and commitment our employees and the communities that support our operations and will help them through this transition," Schwabero added. The expected impact on 2018 performance and long-term planning targets were addressed as part of the Company's conference call on June 25, 2018, as well as the second quarter earnings call. Sea Ray Sport Yacht and Yacht financial results will be excluded from the company's as adjusted, non-GAAP results of continued operations to offer a clearer comparison to go-forward operations. In addition, the company's as adjusted financial information will include the results of the Sea Ray Sport Boat and Cruiser business.